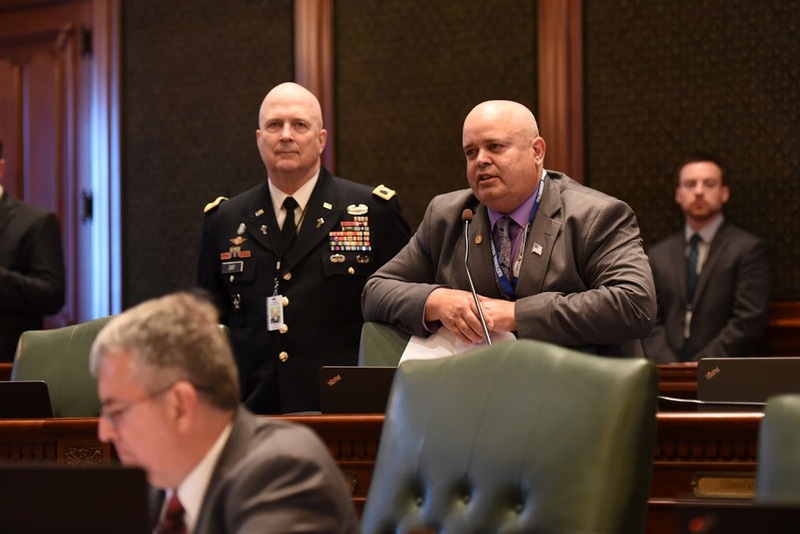 State Representative Dan Swanson hosted First Army Command Chaplain Jeff Zust to deliver the House Invocation on Sunday, May 28 of Memorial Day Weekend. CH (COL) Jeff Zust is a pastor with 32 years of experience from the Southwest Minnesota Synod of the Evangelical Lutheran Church in America. He has served as a military chaplain for 30 years in reserve and active duty positions for both the Air Force and the Army. CH Zust has a Bachelor of Arts in History from Colorado State University, and Master Degrees in; Divinity (Luther Northwestern Seminary), Teaching (Mankato State University), Ethics (Princeton Seminary), and National Security and Resourcing Strategy (National Defense University). He is a graduate of the; Air Force Officer Orientation Course, Air Force Squadron Officer School, Air Force and Army Basic Chaplain Courses, Army Chaplain Career Course, Combined Arms Staff Course, Command General Staff College, Combat Medical Ministry Course, Air Assault, and Airborne Schools, and the Eisenhower School of the National Defense University. He is married to Chom Pun Zust. They have 5 children and five grandchildren, with one on the way.